FRANKFURT, SEPTEMBER 13, 2017 – HARMAN International, a wholly-owned subsidiary of Samsung Electronics Co., Ltd. focused on connected technologies for automotive, consumer and enterprise markets, today announced its collaboration with IBM, G+D Mobile Security and Irdeto, to present a multi-vendor automotive cybersecurity solution for OEMs and fleet managers. At the IAA New Mobility World in Frankfurt on September 12-17, the companies will demonstrate how HARMAN’s SHIELD Platform can be integrated with the IBM QRadar Security Intelligence Platform, Irdeto’s ECU protection solution - Cloakware™ Secure Environment and G+D’s Automotive Security Management Framework to cyber-shield connected cars. As part of HARMAN’s ongoing commitment to keep connected cars protected against cyber-attacks, such as ransomware attempts, the integrated system brings together four industry-leading solutions to deliver complete visibility, detection and mitigation capabilities. 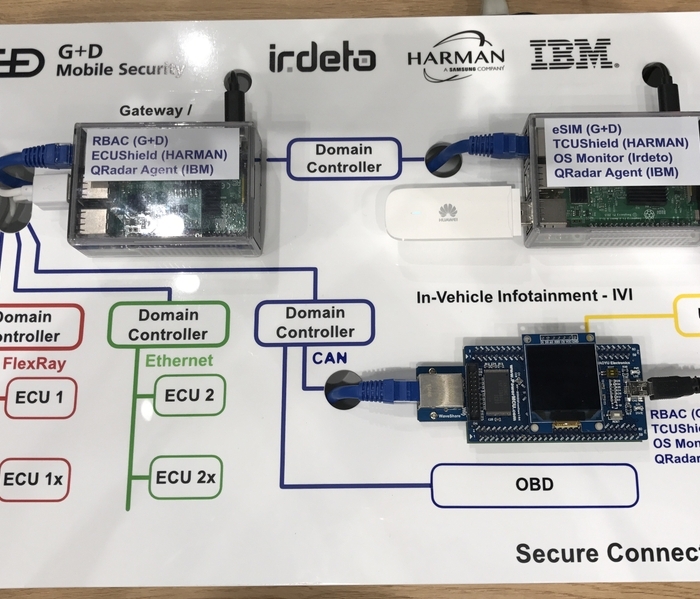 HARMAN and IBM recently combined their respective SHIELD and QRadar platforms in June 2017 to deliver an end-to-end solution that offers on-board detection and mitigation of a range of security threats, along with a robust backend analysis and forensic system. G+D’s Automotive Security Management Framework (ASMF) is a dedicated security management platform to provide security provisioning services for various connected car and mobility use cases. 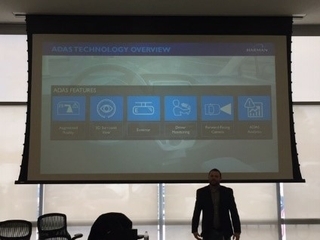 By adding Secure Environment, a component of Cloakware™ for Automotive by Irdeto along with G+D’s Automotive Security Management Framework (ASMF), these capabilities will be expanded and enhanced, allowing OEMs and fleet managers to establish a strong security foundation in their vehicles from the start. During the event the partners will highlight how the integration between their respective offerings can help address a ransomware attack taking place in real-time, by demonstrating the seamless integration between the four companies. 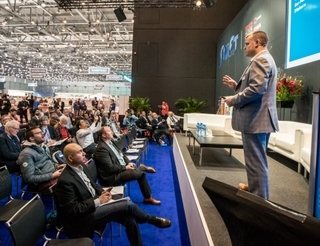 With over 200 speakers and 950,000 attendees, IAA New Mobility World is the leading cross-industry B2B event focused on the future of mobility. 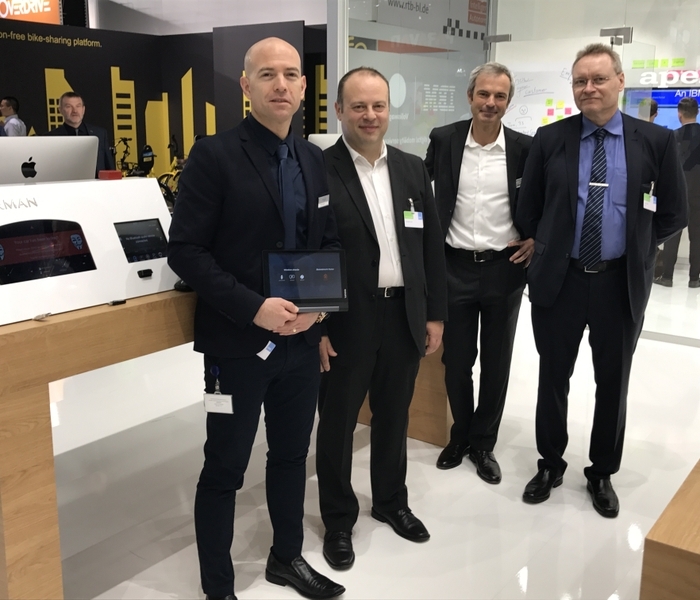 The joint automotive cybersecurity solution will be demonstrated at the IBM booth (C30) at Hall 3.1 New Mobility World, between Sept 12-17. G+D Mobile Security is a global mobile security technology company headquartered in Munich, Germany. The company is part of the Giesecke+Devrient group. G+D Mobile Security manages and secures billions of digital identities throughout their entire life cycle. Our products and solutions are used by commercial banks, mobile network operators, car and mobile device manufacturers, business enterprises, transit authorities and health insurances and their customers every day to secure payment, communication and device-to-device interaction. For more information, please visit: https://www.gi-de.com/mobile-security/. Irdeto is the world leader in digital platform security, protecting platforms and applications for media & entertainment, automotive and IoT connected industries. Our solutions and services enable customers to protect their revenue, create new offerings and fight cybercrime. Irdeto’s software security technology and cyber services protect over 5 billion devices and applications for some of the world’s best-known brands. Our unique heritage as a subsidiary of multinational media group Naspers (JSE: NPN) means that we are a well-established and reliable partner to help build a more secure future. Please visit Irdeto at www.irdeto.com. HARMAN (harman.com) designs and engineers connected products and solutions for automakers, consumers, and enterprises worldwide, including connected car systems, audio and visual products, enterprise automation solutions; and services supporting the Internet of Things. With leading brands including AKG®, Harman Kardon®, Infinity®, JBL®, Lexicon®, Mark Levinson® and Revel®, HARMAN is admired by audiophiles, musicians and the entertainment venues where they perform around the world. More than 50 million automobiles on the road today are equipped with HARMAN audio and connected car systems. Our software services power billions of mobile devices and systems that are connected, integrated and secure across all platforms, from work and home to car and mobile. HARMAN has a workforce of approximately 30,000 people across the Americas, Europe, and Asia. In March 2017, HARMAN became a wholly-owned subsidiary of Samsung Electronics Co., Ltd. For more information, visit harman.com, follow @HARMAN @HARMANSecurity and @HARMANServices on Twitter.